Single view menu covers are made from expanded vinyl wrapped around rigid board with your choice of either crystal clear vinyl or non-glare, matte finish vinyl pocket stitched to menu cover on three sides, open at top, to hold ONE sheet of paper. Metal corner tabs protect corners from becoming dog-eared. 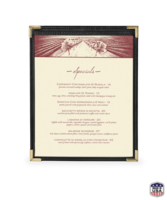 Menu covers are available with or without foam padding. Your name and/or logo can be foil stamped and debossed on non-menu side for a $95.00 setup cost. These covers are made to order/ Please allow 10 to 15 business days manufacturing time. Looking for a thinner, lighterweight menu cover? 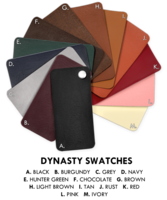 Click here to see our leatherette menu covers with clear pockets and stitched binding. SIZES SHOWN ARE FOR INSERTS THAT FIT INTO MENU COVERS. ACTUAL SIZE OF MENU COVERS IS LARGER. Size8 1/2 in. x 11 in.8 1/2 in. x 14 in. 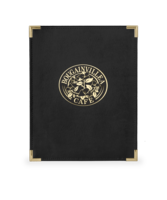 Single menu holders are made from expanded vinyl wrapped around rigid board with your choice of either crystal clear vinyl or non-glare, matte finish vinyl pocket stitched to covers on three sides, open at top. Shop online with the Menu Shoppe today.